Don’t you love when a fantastic artist/band begins their career on the good foot, and just gets better and better like a fine wine? That my friends is The Foreign Exchange for you. The challenge with Love In Flying Colors by The Foreign Exchange is where to begin. You can start by pressing play on any song, in any order, and you will still be satisfied and feel the flow. However, there are so many facets of the album to choose from for microscopic analysis. Should we focus on the heavy 80’s synthesizers and melodies? Or maybe we should concentrate on the immaculate layers of instrumentation, the production, the lyrics…and I could go on. Getting into the spirit and vibe of Love In Flying Colors is a cinch. Who doesn’t want to vibe out to songs about love that isn’t gut-wrenching and tear-evoking, but actually makes you feel good and make you want to cut up a rug? The party begins with the upbeat and rather frenetic pace of “If I Knew Then” featuring Carmen Rodgers, but it’s “After Midnight” that turns up the heat, making way to “Better,” a stellar track with a killer catchy piano riff and it features Eric Roberson. While “Listen To The Rain” may just be as close as you will get to a gut-wrenching tune, it’s well worth it, and perhaps the best track on the album. Finger snaps and Phonte’s melancholy approach on his vocals and instrumentation are fine enough for you to shed a tear – it’s all you need. Another heavenly track that deserves your attention is “The Moment.” Reminiscent of a hot and sweaty house party from yesteryear, it’s easy to get entirely lost in the rhythm. Need a track to cuddle up to with your loved one? If so, then “Dreams Are Made For Two” is definitely for you. 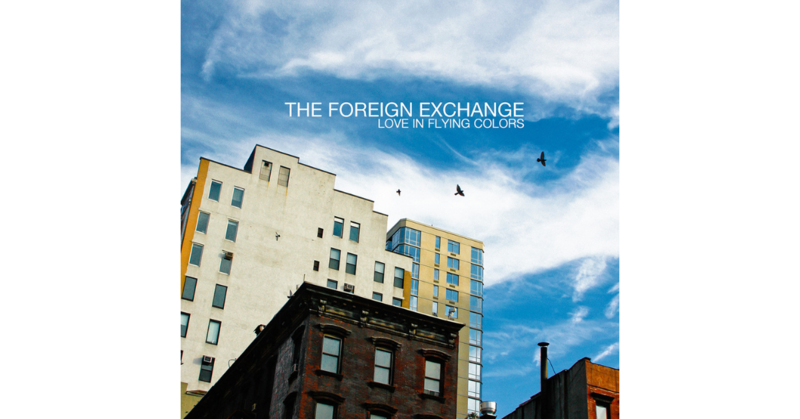 This album is another fabulous addition to The Foreign Exchange’s discography. Phonte and Nicolay have come correct with fantastic production, strong vocals and great guest features. Love In Flying Colors is for FE fans and new admirers alike. Aural Stimulation: “Right After Midnight,” “Better,” “Listen To the Rain.”The Moment” – but really, the whole album.